We are officially in the 4th quarter of Kindergarten and soon we will have a room full of 1st graders! On Friday we will have Career Day! This is always a favorite at KES! We will get a chance to learn about some new careers and touch different types of vehicles outside! It will also be a half day. Students will be dismissed at 11:05. Field day t-shirts were sent home this week for those who ordered one. If you did not order a t-shirt, then please have your child wear any RED t-shirt for Field Day on April 26th. Just a reminder that yearbook orders are due by April 26th. Go to treering.com to order! ~In language arts, we focused on different blends. We wrote creative stories with blends on the i-pads, completed a blend sort, and searched for the missing blends around the room. We also learned about making predictions when reading stories, and practiced this skill with our read alouds. Next week, we will continue to focus on blends. ~In math, we started learning about addition. We made a craft about birds and eggs in a tree, and had to come up with an addition sentence to describe their picture. We also played addition games and worked on our number bonds. Next week we will focus on addition and subtraction. ~In science, we focused on going GREEN! We watched a Brain Pop Jr, read many books, and discussed ways we can help the Earth! We were amazed to learn about what happens to all our recycled items! Next week in social studies we will learn about maps and globes. TGIF! It is hard believe that next week is the end of the 3rd quarter! This will be the last update before Spring Break. I hope you all have a wonderful break! Hopefully, you can make it out to the Festival of the Arts on the 28th. Our class will be performing our poem at 6:25 in the library. Please arrive 10 minutes early. ~In Language Art we dove deeper into story elements. We used post it notes to identify certain parts of a story. We also learned about character traits and how they can change from the beginning to the end of a story. We are almost done with our written reports on our animals and will give our oral reports next week. Our shoe box habitats are coming along nicely and are almost done. ~In math, we finished our unit on money! We had a lot of fun learning how to count pennies and nickels. We also threw in dimes and quarters because we are just so smart. Today we opened up the class store. The hot ticket was the shoes off pass. Students did a super job giving me the correct amount and helping me make change. We will continue to keep the store open even though we are finished with money. ~In science, we learned all about the three states of matter! Next week in science we will be learning about objects that sink and float! Have a great weekend and enjoy the weather! TGIF! We were very busy today making our leprechaun traps. We are hopeful that we will catch that tricky leprechaun! If you haven’t already, please send in a shoe box for your child to create their animal habitat. We only have had about half the class bring them in! Field trip forms to the Children’s Museum were sent home this week. Please send in your signed permission form and $9 by next week. Information about the Spoken Word Café came home today in students’ orange folders. This will be one of the activities during the Festival of Arts on March 28th from 6-8:00pm. Our class will be reciting the poem, The 100th Day of School at 6:25pm that night. In language arts we learned about the -ing and -ed endings. We learned that -ing is used for the present and that -ed is used for the past. We had a lot of fun making new words and putting them in sentences. Today we wrote about what is worth more to us than gold. We had some very sweet responses and nobody said their devices! ~In math, we are all about money! This week our focus was on counting pennies and nickels. Some friends even started counting dimes and quarters! This is a great life skill to practice at home or even as you are shopping. We got into a discussion on how to read price tags and I encouraged them to look for some the next time they are in a store. We will continue with money next week and open up our class store! In science, we started our animal research projects! We have picked our animals, printed our research, and highlighted important information. Thanks to everyone who has sent in their shoe box. We will continue with our project next week. 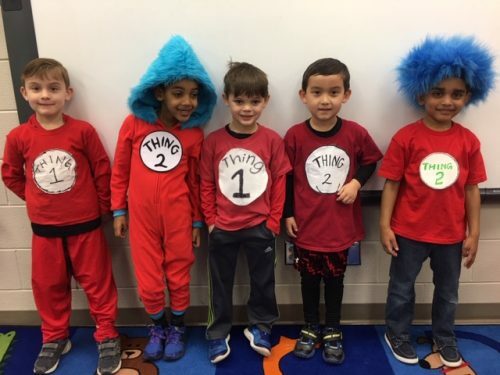 Read Across America Week was a huge success! Thanks to everyone who participated in the spirit days. Here are some pictures from today! Coming home today is an interim report for the 3rd quarter.We are halfway through the 3rd quarter. I feel like I just sent home report cards! You will receive another one halfway through the 4th quarter as well. In 1st grade they will be given out every quarter. 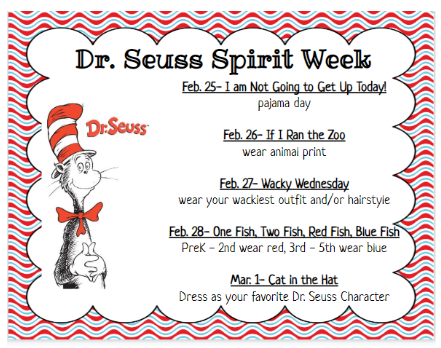 ~In language arts, we read many Dr. Seuss books and completed some fun activities to go along with our favorites. We read The Cat in the Hat and wrote about what happened in the beginning, middle, and end of the story. 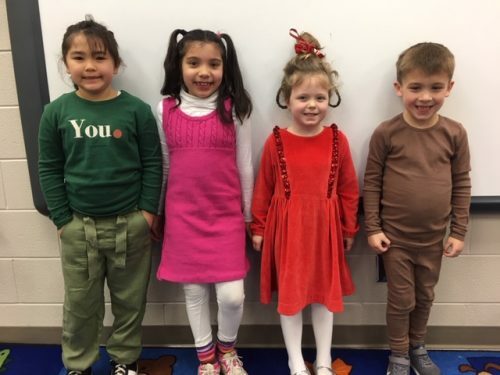 On Wacky Wednesday, we wrote about our own Wacky Wednesday and then shared them with the class. On Thursday we read The Lorax and discussed what we would do if we had the last truffula seed. Today, we voted on our favorite Dr. Seuss book, and the winner was….How the Grinch Stole Christmas! ~In math we learned about different ways we measure time, length, and height. We compared our height with each other, measured length with our feet, and discussed how long certain activities take to complete. Next week, we will learn about weight, temperature, and volume. In social studies, we finished up with our study of presidents and American symbols. Next week we begin discussing spring! I wish the weather would cooperate and begin to warm up! In math we were all about the number 100 this week! Next week we will move on to our 2 week unit on measurement. First, we will learn about time, height ,and weight. In social studies we learned about George Washington. We listened to many stories, watch a Brainpop jr., and made a mini book. Next week we will compare George Washington and Abraham Lincoln, as well as learn some important American symbols. What a fun week in room 135! Valentine’s Day was filled with much excitement and the class couldn’t wait to exchange their cards. 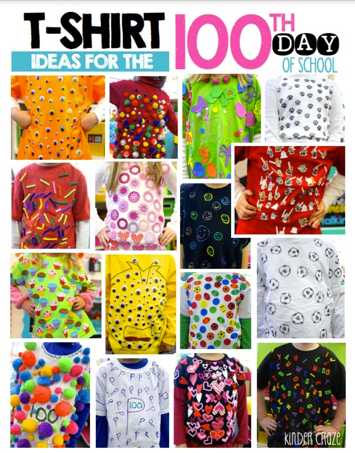 Remember that Thursday is the 100th day of school! We will be doing many fun activities at school and look forward to seeing the t-shirts you have made! ~In language arts, we learned about the “th” digraph. We generated a list of words that begin and end with “th” and then wrote some of them down. We read a funny story title, That’s Good, That’s Bad. We we enjoyed watching the main character think things were good, but they turned out bad! We then drew and labeled things from our own experience that was good…then bad! We also read another hilarious book titled, What if I Had Animal Teeth. The students then got to pick what kind of animal teeth they would like to have. We created our new self-portraits and wrote about why we picked those teeth. In our literacy centers we wrote thank you notes to people, made a hidden message, and completed a valentine rhyme. ~In math, we continue to have our daily warm up question that get our brains thinking. We also practiced our tens and ones with our tens rods and ones cubes, and on Valentine’s Day we had a special BINGO with numbers up to 100! Next week it will be all about the number 100!! ~In social studies we had fun learning about Valentine’s Day and making crafts for our families. Next week we will learn about George Washington! TGIF! Please remember to send in your Valentine’s Day cards and box/bag on the 14th. A class list was sent home a few weeks ago. If you need another one just let me know. If your child is planning to exchange cards, they must have a card for every child in the room. We also have another very special day coming up. On Thursday, February 21st will be the 100th day of school! We are asking each child to decorate a plain t-shirt with 100 items on it. Information went home in orange folders today, but here is a picture of what it could look like. ~In language arts, we learned about the “sh” digraph. We generated a list of words that begin and end with “sh” and then wrote some of them down. We also read a book titled Shark Problem. We discussed what the problem was in the story and then came up with our own ideas on how to solve it. 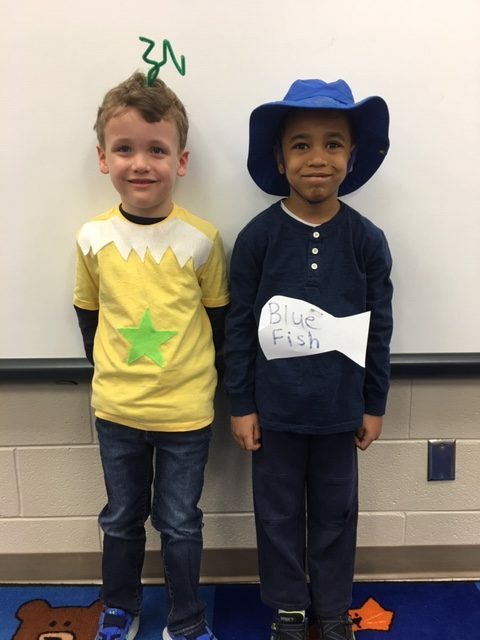 We also listened to everyone’s favorite song…Baby Shark. 🙂 In our literacy centers we did a digraph word sort, read parts for our readers’ theater, practiced our sentence writing, and looked for real vs nonsense words. Next week, we will focus on the “th” digraph. ~In social studies we learned about Abraham Lincoln. We read many books, watched a Brain Pop Jr., and research some facts on Pebble Go. This class is so fascinated with learning about our famous Americans. They get so excited when I pull out another book to read and enjoy telling me all that they have learned. Next week we will focus on having some Valentine fun! We have officially made to the halfway mark of kindergarten! It is always amazing to think back to September and realize how much they have grown academically, socially, and physically! This is a great group of kids, and I look forward to seeing even more growth the second half of the year. World Read Aloud Day is Friday, February 1st. KES coyotes will be making Global Connections Through Reading during an assembly on that day and then in their classrooms throughout the month of February. To prepare for our assembly, I am asking each and every KES family to share ONE picture of your family reading together and send that picture to your child(ren)’s teacher by Monday, January 28th. The pictures will be used in a slide show that will be shared during our assembly. Our goal is to have every child in every classroom represented in the slide show. Please help us show how much our coyotes love to read at KES! We have finished learning all the letters and sounds. We will continuously review them throughout the year. Students have also been taught how to form all the letters. This is a work in progress, but I remind the class daily about how important it is to make letters correctly. We will now move on to digraphs, beginning with “ch” next week. We continue to “play” with numbers and this week we went all the way to 50. We even looked at some 1st grade word problems! Those really stretched our brain, but we were up to the challenge. We ended out week with some fun math centers. Next week, we will be working on numbers all the way to 100! We learned all about Dr. Martin Luther King Jr. this week. We read books, watched a Brain Pop, and wrote what our dream was. Today we painted our own peace symbols. Next week, we will learn about shadows during science! It was a fun Friday in room 135 today! We had a visit from Mr. C, our technology teacher, and he showed us how to do a Flipgrid! We were very lucky to be the first K-1 class on chromebooks and logging in using our very own QR code! Mr. C taught us how to make a video using Filpgrid to show what we learned about penguins and polar bears! We had an awesome time listening to everyone’s facts. Mr. C is in the process of getting a shareable link for parents. I’ll send it out as soon as I get it! World Read Aloud Day is Friday, February 1st. KES coyotes will be making Global Connections Through Reading during an assembly on that day and then in their classrooms throughout the month of February. To prepare for our assembly, We are asking each and every KES family to share ONE picture of your family reading together and send that picture to your child(ren)’s teacher. The pictures will be used in a slide show that will be shared during our assembly. Our goal is to have every child in every classroom represented in the slide show. Please help us showcase how much we love reading, and especially reading aloud, at KES! 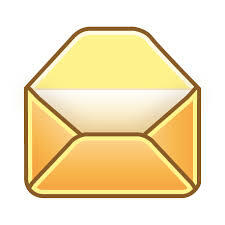 Language Arts- Our focus this week was on the letter Uu. We did sorts with the short Uu sound, made short Uu word families, and wrote sentences. We also read a fun story called Sneezy the Snowman. It is a silly story about a snowman that can’t get warm, because he always starts to melt! We then made our own sneezy snowman and wrote what made our snowman melt. We also dove into non fiction texts and discussed how they are different from fiction. We read many non fiction books this week and realized that we read non fiction books differently than fiction. Next week we will focus on the short Ee sound. Math- In math we continue to work on number sense. We specifically worked on counting objects up to 20 and then writing the corresponding number. We also extended our activities with numbers well into the hundreds and even learned a little bit about place value. Science- We finished up our research on penguins and polar bears today with our lesson from Mr. C. Earlier in the week, students chose which animal they were most interested in learning about. When then used books from the library and pebblego on the ipads to collect our facts. Next week we will learn about Martin Luther King Jr.
A full five days this week! We are definitely working on our stamina to keep focused for five days in a row. Looking at the weather reports, we may have a short week again! This has been a crazy winter. We finished up the short Oo sound and enjoyed Opposite Day today! We had a lot of fun reading books from end to beginning, writing our name backwards, and just being silly has we talked to each other. We all hope everyone has a bad weekend! Next week, we will focus on the short Uu sound as well as researching with non-fiction books. We finished up our unit on more and less. We played lots of hands on games and played with numbers in our head to figure out what was one more and one less. Next week, we will be working on counting sets with numbers up to 20. Today was a great day to talk about the winter season because it was so cold! We also put the months of the year in order and filled out a January calendar. See if your child knows the days of the week and what days come before and after. We work on this skill every day in calendar, but would love for it to be reinforced at home too! Next week, we will research animals in the winter.